Dr Sultan Pradhan, practising surgical oncologist at the Prince Aly Khan Hospital, P.D. Hinduja Hospital and the Breach Candy Hospital was conferred with the prestigious Dhanvantari award at the Taj Mahal Palace, Mumbai, at a glittering function with the creme de la creme in attendance. 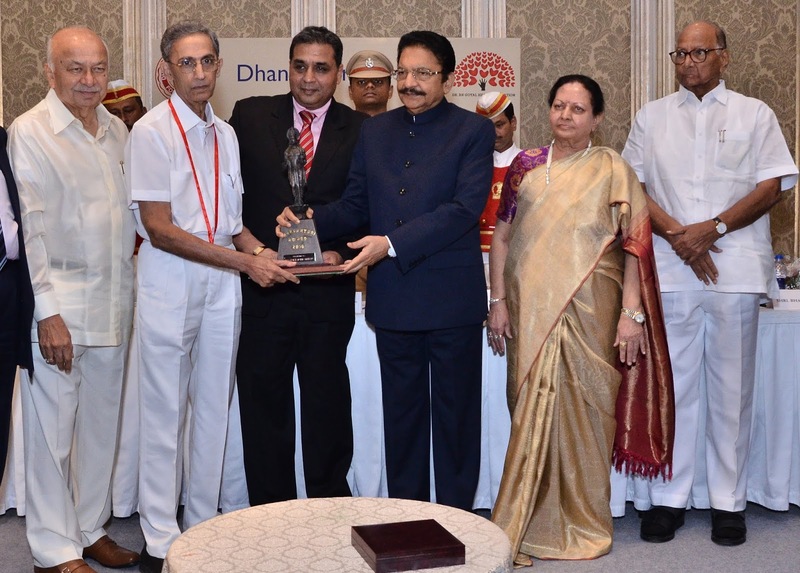 Doing the honours for this extremely soft-spoken, brilliant, surgical oncologist was Governor Vidyasagar Rao. The other guests of honour included Sharad Pawar, Sushil Kumar Shinde, Padmashree Dr D. Y. Patil, Rahul Goyal, Dr Lekha Adik Pathak and Bharat Taparia of Bombay Hospital. The event was held under the age of The Dhanvantari Medical Foundation and the Dr.B.K. Goyal Heart Foundation. Addressing the gathering, Governor Vidyasagar Rao described Dr Sultan Pradhan as the gentle giant in the field of cancer surgery who had given a new lease of life to many. he also waxed eloquent on his various initiatives to eradicate cancer from the tribal areas ofMaharashtra. Dr Sultan Pradhan while humbly accepting the award paid rich tributes to all his mentors and fondly recalled his formative years and learning experiences at various hospitals across Mumbai. He further pledged to take the movement of affordable cancer treatment to the deprived sections of society and eliminate what he aptly described as the " Sea of Sorrow' arising out of lack of access to state-of-the art healthcare. Rahul Goyal, Managing Trustee, Dhanvantari Medical Foundation, gave a fascinating insight into the history of Dhanvantari awards under the able leadership of his father , the late Dr. B.K. Goyal. He also assured the audience that he would continue to work on all the projects and charitable initiatives undertaken by his father and ensure that they reach their logical conclusion. Dr.
Lekha Adik Pathak, Trustee, Dhanvantari Medical Foundation, strongly asserted that the 'Prevention of sudden cardiac arrest' programme under the aegis of the Dr B.K. Goyal Heart Foundation would now be taken across the country and made a mass movement. She also paid rich tributes to the vision of late Dr B. K. Goyal in bringing all types of medical practices under one common platform.